EXTENDED AR-10 REAR TAKEDOWN PIN W/ PARACORD. This model is for ar10 (.308 Win. / 7.62x51mm NATO) models only! EXTENDED AR-15 REAR TAKEDOWN PIN. EXTENDED AR-15 REAR TAKEDOWN PIN W/ PARACORD. FN PS90 MUZZLE EXTENSION. THE MUZZLE / BARREL EXTENSION IS TO MAKE THE RIFLE LENGTH MEET CALIFORNIA LAW REQUIREMENTS. 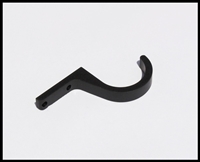 IT IS MADE FROM 6061 ALUMINUM AND IS ANODIZED BLACK. 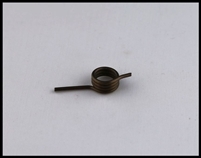 THIS REPLACEMENT SPRING IS MADE OF HIGH TENSILE SPRING STEEL WIRE, AND INCREASES THE HAMMER POWER OF THE ISSC M22 PISTOL TO MAKE THIS GREAT LITTLE PISTOL MUCH MORE RELIABLE WITH ALL TYPES OF AMMUNITION. GUNSMITH INSTALLATION SUGGESTED, BUT NOT REQUIRED. A MINIMUM LEVEL OF KNOWLEDGE OF YOUR PISTOL IS ALL THAT IS TRULY NEEDED TO PERFORM THIS CONVERSION. IWI TAVOR EXTENDED FLASH HIDER. KEL TEC RFB MUZZLE BRAKe. 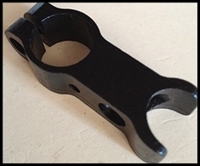 THE MUZZLE BRAKr IS CARBON STEEL AND BLACK WITH A BLACK OXIDE FINISH. The Loop Hole is a 7075 aluminum thumb hook that can be added to any featureless pistol grip replacement, or featureless stock. It allows complete control of the rifle with one hand, and is strong enough to lift the entire rifle. It eliminates the uncomfortable grip required with most featureless stocks. A truly great CA compliant accessory for California gun owners in 2018 and going forward! PATRIOT MAG RELEASE (BB RELOADED) REPLACEMENT DISC FOR ALL AR-15 / AR-10 PMR UNITS. 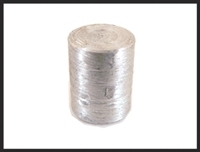 Patriot Mag Release Epoxy Packet. One (1) unit per order. 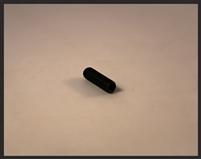 THE SIG SAUER MCX STOCK STOPPER FROM BULLET BUTTON® IS DESIGNED TO FIT THE SIG SAUER MCX RIFLE. THIS SIG SAUER MCX STOCK STOPPER FROM BULLET BUTTON® IS MADE OF BILLET ALUMINUM AND IS ANODIZED. 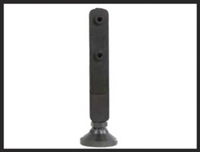 THE SIG SAUER MPX STOCK STOPPER FROM BULLET BUTTON® IS DESIGNED TO FIT THE SIG SAUER MPX RIFLE. THIS SIG SAUER MPX STOCK STOPPER FROM BULLET BUTTON® IS MADE OF BILLET ALUMINUM AND IS ANODIZED. 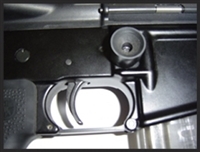 SKS PARATROOPER FRONT SIGHT (BY BULLET BUTTON®). 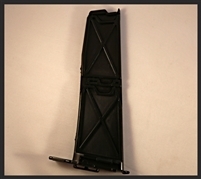 AR-15 STANDARD MAGAZINE / MAG RELEASE. Tactical Chipmunk™ AR-15 Snap Lock CA AR-15 Compliance Device. The Snap Lock works in a similar fashion as a Patriot Mag Release, not allowing the AR magazine to be released until the upper receiver is separated from the lower receiver via the rear takedown pin. 2017 / 2018 California compliant!